The UI Patterns website lists a large number of current and emerging design patterns. Under the section called Persuasive Design Patterns, and many of these patterns are commonly seen in social media websites that are aimed at attracting new users or creating incentives for them to spend money. It feels like that some of them would fall into the definition of a 'dark' pattern. My question is: what types of persuasive patterns fall into the 'dark' pattern category, and is there somewhere that is sensible to draw a line? As always, there's a spectrum here. It's not black and white as there isn't one point at which an interaction suddenly flips from being simply a persuasive pattern to being a dark pattern. It's also subjective because different people will perceive the same interaction in different ways. Both in terms of different users, and in terms of the provider and the receiver. However, let's continue on the basis that we have to consider the question in terms of generalities rather than specifics. Persuasive patterns generally rely on the provider utilizing an understanding of human psychology and biases in behavior, cognition, instinct, reaction, aversion, emotion, etc. I think it's acceptable and often correct to use this understanding of bias in order to provide an interaction which allows for these biases. However, where the persuasive interaction starts to become a dark pattern is where the psychology is used to prod or distract the user in a way that departs from a typical user's expectations. There are obviously tricks of interaction, like making a close button on an advert go to the advertisers website anyway. (I've seen this on an EE advert on YouTube). That's dishonest trickery plain and simple, but I don't lose money so it doesn't seem a big deal, just annoying. It plays on users expectations and defies them point blank. Realization comes instantly after. The more interesting area is the cusp from persuasive to dark - before we get to that anti-pattern of obvious dishonesty. Closer to the cusp is misdirection, where for example the user is used to a primary button being brightly colored, and a secondary action less prominent. Swapping the two styles to trick the user into not cancelling an order or a subscription is a dark pattern. It relies on a user's muscle memory or instinct to force an action before the user has a chance to grok the situation. What can make it worse is if there's no subsequent confirmation that allows the user to realize or correct the situation. That's almost dishonest and deceitful, if not actually lying about a situation. Closer still to the cusp is when silence or inaction on the part of the provider promotes one user path, when better signposting, highlighting or labeling could have been more helpful. That doesn't feel quite dishonest either, just a bit sneaky! Nevertheless, if it's applicable to a silent continuation of a subscription without pro-active engagement with the user to confirm they want to continue, then irate customers are only to be expected. It was in our T&C won't cut it for most people. There's a key point in that example. Users will put up with a little sneakiness if the consequences are low. But if the consequence is that I end up out of pocket - that stings. Where something could have been done to improve the interaction, but deliberately wasn't. Where something could have been provided in a generally expected format, but deliberately wasn't. Where backing out of a flow could have been easier but was deliberately made less so. Where warning signposts could have been provided but deliberately weren't. Where surprise behaviors 'in excess of expectations' should have been called out but weren't. Where clarity could have been more upfront, but deliberately wasn't. These are all examples of dark patterns, and the common element is that it's a deliberate part of the design. There is bad design of course, and careless design, and poorly thought-out design, but dark patterns are an intentionally 'crafted' design. 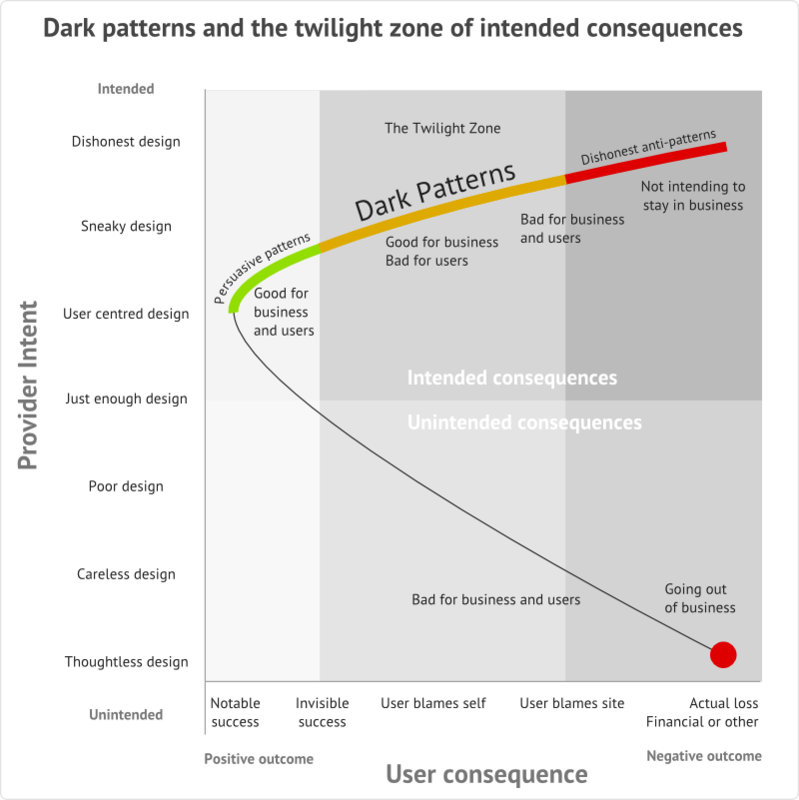 Some will consider dishonest design to be dark patterns too, but in my opinion the distinction is an important one: dark patterns are those in the twilight zone where the user is generally not expected to realize what's going on. If they do realize then the user feels a bit stupid, like it's their own fault they chose one action over another. Persuasive design is more likely to result in users feeling a buyer's remorse or that they hadn't realized something. While dishonest design is more likely to result in users feeling completely conned or tricked - they know the fault wasn't their own! Persuasive design can feel smart, slick, frictionless, and playing to human nature. Dark pattern design plays on that to achieve a desired outcome efficiently. Dishonest design plays on it further to actually deceive to achieve an alternate outcome. But as I started off saying at the beginning, it's still a gray area - because it's all part of a continuous curve. Harry Brignull has been active in cataloging and raising awareness (including naming and shaming) of dark patterns found in the wild. You can find articles like those on ArsTechnica discussing examples, but Harry also has a dedicated website https://darkpatterns.org/ and a Twitter account. Dark Patterns are designed to trick the user, the actions implied are not honest and most of the time are unethical. The persuasive design tries to change user behavior through techniques like suggestions, influence and the formation of habits and is more ethical. I think a persuasive pattern, that is not a dark pattern too, implies the user in the process, try in a more informative way to convince him to make a decision that is not against his own interest, intrigues him. What situations might it be acceptable to design something that would be considered unethical?